Raychem T2 Red Underfloor Heating Cable. Click here to order Raychem T2 Red Underfloor Heating Cable. The intelligent underfloor heating system. The Raychem T2 self-regulating system senses other heat sources, such as solar radiation, electrical appliance and lighting. It automatically adjusts its heat output accordingly. In colder places, such as near windows and doors, more heat is produced by the system. In warmer places, such as under rugs and furniture, less heat is produced. The cables do not overheat, meaning that there is unlimited flexibility for moving your furniture around. - Easily adapted to all room shapes and sizes. - Flexible. Cut to length, no cold lead needed. - Ideal for renovation. Reduced height (max. 8mm). Raychem T2 Red Underfloor Heating – with T2 Reflecta. It is recommended that Raychem T2 Red Underfloor Heating is installed with T2 Reflecta insulated plates. Click here to view further information. Subfloor: Cement screed. Anhydrite screed. Wooden floor. Gypsum board. Timber floor board. Asphalt screed. * Must be suitable for underfloor heating. (Maximum resistance to heat transfer 0.15 W/m2K). How much cable to order. 1. New construction – good insulation. 35 W/m2 – 60 W/m2. 2. Renovation – good insulation. 60 W/m2 – 100 W/m2. 3. Insufficient insulation – more output required. 1. Select the required power output and required cable length per m2. The tables below show the spacing and required cable length per m2 and the spacing between the cables. The power output gives approx. 20-25⁰ C (depending on the subfloor construction). For higher output please contact us on 01484 859700. 2. 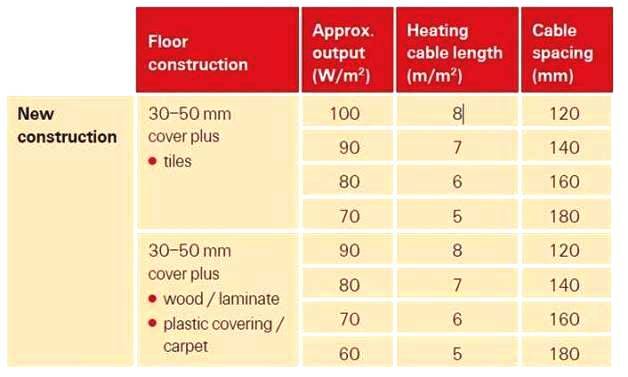 Multiply the cable length m2 by the total floor surface (m2). Example: Renovation of bathroom (5m2) with tile floor. Select 15mm cover plus tiles. Select 80 W/m2 (7 m cable needed per m2). Spaced between two cable runs is 140mm. 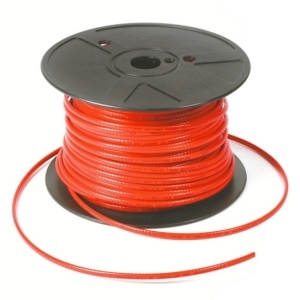 Required cable length is 7 x 5 = 35m T2 Red heating cable + 2m for connection in junction box = 37m. Technical data Raychem T2 Red Underfloor Heating Cable. Power Output. 50 – 100 W/m2 (5 -15 W/m)*. 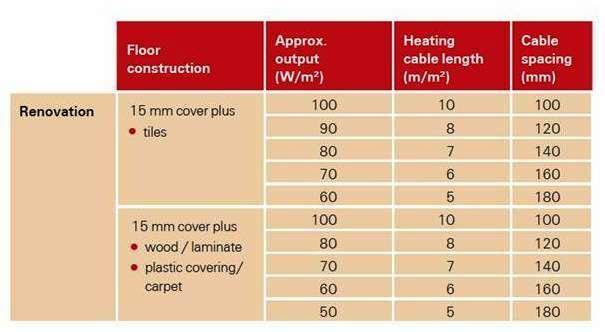 Maximum Heating Cable Circuit Length. 100 m @ 10 A.
Max. Dimensions (width and height). 6,0 mm x 8.7 mm. * depending on the cable spacing/floor construction and covering. Values stated in stable conditions at 25⁰C floor temperature.